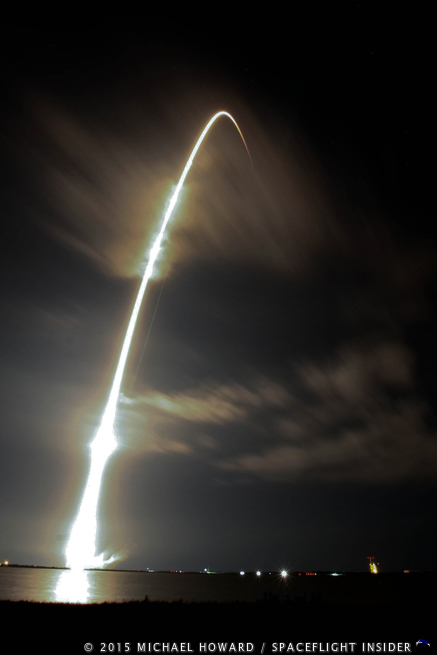 On Saturday, Jan. 10, 2015, Space Exploration Technologies Corporation (SpaceX ) launched a Falcon 9 rocket from Launch Complex 40 at Cape Canaveral Air Force Station, carrying an unmanned Dragon spacecraft carrying supplies and scientific experiments for the International Space Station (ISS). The spacecraft made rendezvous with the ISS early Monday morning, was grappled by the ISS’s robotic arm at 5:54 a.m. EST (1054 GMT), and successfully berthed to the station three hours later at 8:54 a.m. EST (1354 GMT). The spacecraft carried the Cloud-Aerosol Transport System (CATS ) experiment which will be attached to the Japan Aerospace Exploration Agency (JAXA) Kibo module and used to study particulates in Earth’s atmosphere using a laser which will strike the surface of the Earth and provide analysis of backscattered light. This will allow for altitude measurement of aerosols in the atmosphere. The ISS Drosophila Experiment, or Fruit Fly Lab-01, will study the effect of weightlessness on the immune systems of fruit flies. The Micro 5 Experiment will study the immune systems of roundworms which are exposed to salmonella typhimurium. The NanoRacks Self-Assembly in Biology and the Origin of Life (SABOL ) will study the growth of amyloid fibrils, which are associated with diseases such as Alzheimer’s, spongiform encephalopathies, and type II diabetes, and which form insoluble fibers that resist degradation. Also included in the Dragon’s payload are a number of satellites which will be deployed by the ISS, including a number of small CubeSats called Flock-1d, which will replace the ones destroyed by the crash of Orbital Sciences’ Antares rocket in Oct. of 2014. Brazil’s AESP-14 satellite will study plasma bubbles in the ionosphere. The spacecraft is also delivering an IMAX camera and tools for upcoming spacewalks which will install international docking adapters. The robotic arm was operated by Expedition 42 commander Barry “Butch” Wilmore with assistance from astronaut Samantha Cristoforetti, and is now berthed to the Harmony module. It will remain berthed there for four and a half weeks before returning to Earth with crew supplies, hardware and computer resources, science experiments, space station hardware and trash, amounting to 3,600 pounds. After Dragon was berthed to the station, Wilmore radioed to Mission Control “We will be digging in soon. It took a couple of days, but it’s great to have Dragon on-board.” Wilmore is a Navy test pilot with 6,200 hours of flight time and 633 carrier landings. He also helped to develop the T-45 Goshawk trainer jet. He served as pilot on STS-129 aboard Space Shuttle Atlantis. He boarded the International Space Station in Sept. 2014. Cristoforetti is an Italian Air Force pilot and an astronaut with the European Space Agency (ESA ). She is one of the first women to be a lieutenant and a fighter pilot in the Italian Air Force. Expedition 42 is her first space flight. This is SpaceX’s fifth Commercial Resupply (CRS) mission to the ISS, and the Dragon capsule is the only operational spacecraft capable of returning significant amounts of supplies to Earth. 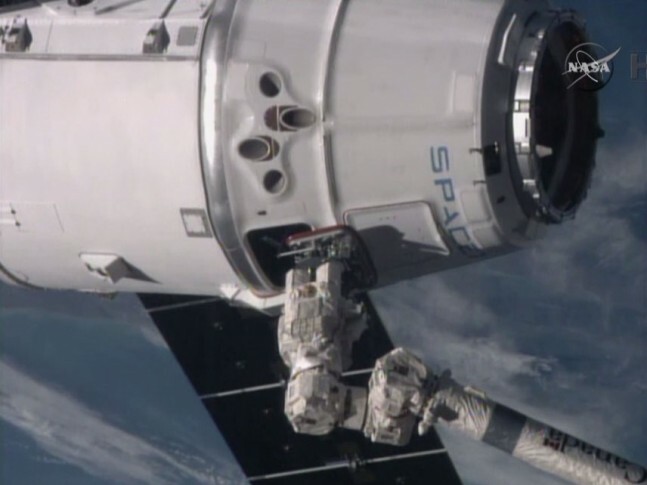 Dragon will remained berthed to the International Space Station for approximately one month. The spacecraft will then return to Earth, and splash down in the Pacific Ocean off the coast of southern California. Nothing needs to come back but people. No product of value has been manufactured in space in the several decades of space station efforts to do so. It is an advertising slogan. And since the dragon is a long way from carrying anyone it should be if anything embarrassing for SpaceX. But the miracle of public relations and legions of adoring fans allow it to reported as the opposite. The Testing of the products made in orbit by a ground based scientist is very important to fully inderstand everything done. The real science is done dirt side. So beleiving that nothing comes from the research done in orbit is false. Except there are no products being made in orbit. Believing that several tons of science experiments must be returned to Earth is false. There are products being made, remember the 3-D printer? And no one stated that there were “several tons of science experiments”. Please reread the article. The author stated something quite different.